Data center consolidation leads to enormous benefits for businesses beyond cost reductions. For CIOs revisiting their data center strategy, we've outlined four benefits of data center consolidation and improvements for the business. Consolidating data center facilities offers the ability to enhanced operations, improve redundancy and flexibility, deliver higher availability and better use of IT assets. By streamlining your critical infrastructure, firms can do less with more, ultimately helping improve the end-user experience. Firms can realize increased energy efficiencies through hardware refreshes during a consolidation program - right-sizing to more energy efficient platforms. Transitioning to newer infrastructure typically results in lower PUEs (Power Usage Effectiveness) and lower electric bills. This can deliver direct savings to an organization, allowing for reallocation and reinvestment of capital. Reducing your data center footprint enables centralization of data center infrastructure, which strengthens security and streamlines management. Reducing the size of your critical infrastructure helps reduce the attack landscape and scope of security for your organization. Consolidation also helps reduce risk by eradicating outdated, end-of-support platforms, mitigating opportunities for system failure. Consolidation or divestiture of your data center assets also improves disaster recovery (DR), enabling businesses to implement a more robust DR plan that also encompasses options for replication in the cloud. Through carefully planned consolidation and migration activities via data center experts, firms can introduce best-practices for ongoing operations. Leading firms use consolidation events as an opportunity to implement advanced management tools, systems and processes to provide real-time insight and transparency into their IT estate. One of the biggest business drivers for data center consolidation is cost reduction. In fact, proper consolidation programs can lead to millions of dollars in cost reductions enterprise-wide. For over three decades, the world’s leading enterprises have relied on the unparalleled expertise, best-practice processes and innovation of Align. We’ve helped businesses from small regional firms to leading financial firms and the leading SAS providers in the world successfully design and build, manage, operate and consolidate data centers to optimize performance, reliability, productivity and efficiency. Check out some of our success stories here. Revisiting your data center strategy or have questions regarding your critical infrastructure options? Speak to a data center specialist today. 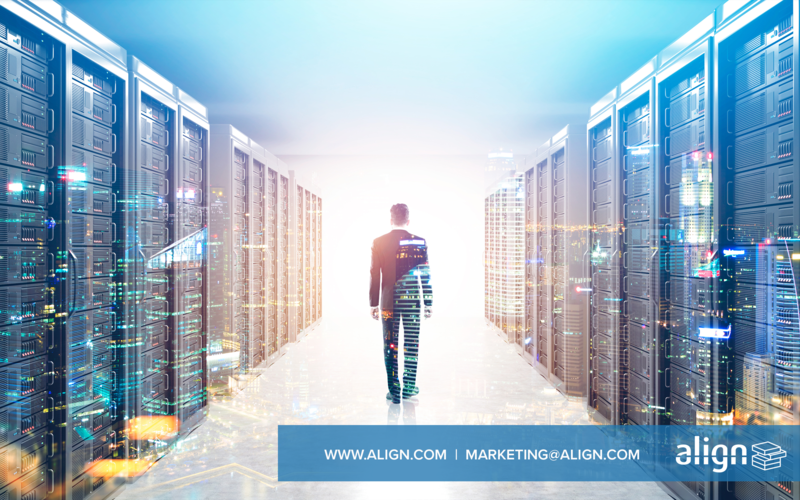 For more information about Align's Data Center Consolidation Services, visit here.